I was happy to stumble upon the free Kongregate game Midas today. Created by Melbourne-based Kongregate user wanderlands, it's a simple 2D platform/puzzler based around the story of King Midas. King Midas, as you may remember from Greek myth, was granted the magical ability to turn everything he touched into gold. Of course, he soon realized that this was a mixed blessing, as the food he touched also turned to chunky, inedible Au79. Midas the game works on a simpler level—you are King Midas, and you must get to your wife. Cute little messages pop up between levels as Midas reflects on his plight—everything he touches turns to gold, and to complete the level, he must touch his wife, but if he does so straightaway she'll just turn to gold. So first, in accordance with the myth, Midas must touch the river Pactolus to wash away his accursed ability before touching his beloved. However, turning suspended blocks to gold is vital for traversing the levels. 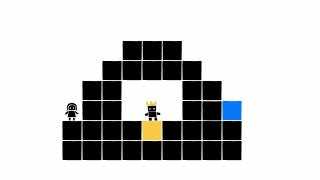 Gold is heavy, and golden blocks fall to the ground, opening up pathways through the level. Therefore, all gold-transmogrification must happen before Midas touches the water. I'm not super-far in the game, but it's already gotten quite tricky. Go give it a play; I hope you'll be as pleasantly surprised as I was.